Despite the plethora of college basketball teams, there are very few pairs of brothers who are current Division One coaches. One of those coaching brother duos are Bill Herrion (New Hampshire) and Tom Herrion (Marshall). The rest of the family also has basketball ties, as Bill’s father Jim was also a coach and Bill’s son Ryan played for him at New Hampshire before becoming a grad assistant for his uncle at Marshall. Jon Teitel sat down with Bill to try to figure out who is the best coach in the family. Your dad Jim was an assistant coach at Holy Cross and head coach at Worcester Polytechnic Institute. How much of an influence was he on your own decision to become a coach, and what was the most important thing you ever learned from him? His influence was enormous and was the main reason I eventually got into coaching. He used to run basketball camps on outdoor courts up in the Catskills – I am talking old school! I have been around the game my whole life so after I graduated from college I knew that I really wanted to get into coaching. From 1985-1990 you were an assistant at Boston University under Mike Jarvis. How did you like being in Boston, and what made Jarvis such a great coach? I was a local guy and some of my coaching friends introduced me to Coach Jarvis. The thing that I really learned from him is how to run a program: he is a great organizer who taught me all the ins-and-outs of coaching. Boston made the tournament in 1988 only to be eliminated by Duke in a first-round contest played in Chapel Hill, NC. What are your memories of the 1988 NCAA tourney (Danny Ferry scored 21-points)? We lost to Northeastern in the conference tourney finals in 1986 and 1987 before finally breaking through in 1988. It was basically a home game for Duke. Ironically, future Duke star Kyrie Irving’s dad Drederick was our star guard at the time. Duke was loaded with Ferry, Tommy Amaker, etc. We competed and played really well. What are your memories of the 1990 NCAA tourney (Chris Smith, Nadav Henefeld each scored 19 points in a win by UConn in Hartford)? That was when UConn was really starting to get it going. They used a 2-2-1 full-court press against us. In 1991 you became head coach at Drexel, where you won three straight conference championships from 1994-1996. Why did you take the job, and how were you able to build such a dominant program? I was a little apprehensive to take the job at first because I was comfortable being an assistant with a lot of responsibility under Jarvis. We got off to a bad start my first year and were kind of going nowhere, but things turned around after we got into conference play with a senior-laden team. We got really lucky with recruiting when Malik Rose fell into our lap as a local kid from Overbrook High School. We had great chemistry with a bunch of guys who bought into what we were doing and we went on a big-time roll. What are your memories of the 1994 NCAA tourney (you lost to City 6 rival Temple as Aaron McKie outscored your team by himself [21-20] in the 2nd half)? We were in a big conference room on Selection Sunday: little did we think that they would have us face a team right down the street. Everyone in the building went nuts…but I could not even breathe because Temple had McKie, Eddie Jones, Rick Brunson. The whole week leading up to the game we actually practiced 5-on-8 to prepare for their match-up zone defense. It was a close game at halftime so our guys were celebrating, but we could hear John Chaney screaming at his guys down the hall. What are your memories of the 1995 NCAA tourney (Malik Rose had 17 points and 18 rebounds in a loss to Oklahoma State, who was led by Bryant Reeves with 21 points and 11 rebounds)? We were in Baltimore that year after being in Landover, MD the previous year, so it was nice to be only a bus ride away. The Penn-Alabama game before us went into OT (Editor’s note: Jon Teitel sat on press row for this game watching Antonio McDyess score 39 points to beat his beloved Quakers), so our game did not start until very late. We got off to an ugly start, the score was 4-2 after the first 10 minutes. What are your memories of the 1996 NCAA tourney (Rose had 21 points and 15 rebounds in an upset over Memphis, then John Wallace scored 18 points in a win by Syracuse)? We were very good that year (26-3 entering the tourney) with Malik leading us as a dominant senior. Unlike the previous two years we had to get on a plane because we got sent west to Albuquerque. We were a #12-seed, which was high for a team from our conference, but we had earned it by then. Memphis was a talented team that was very athletic but I do not think they knew a lot about us. We opened up a double-digit lead in the second half and it was never really in doubt. It turned out to be a major upset, but Princeton upset defending champion UCLA the same day and got all the press. Malik sprained his ankle against Memphis but we still gave Syracuse a good game. For a school like Drexel to win a game in the tourney, it was like winning the national championship. In 1996 you were an assistant coach on the Under-22 national team that won a gold medal in the World Championship qualifying tournament in Puerto Rico. What did it mean to you to win a gold medal, and which of your players impressed you the most (Tim Duncan, Paul Pierce, other)? Mike Montgomery of Stanford was our head coach so we spent 10 days practicing in Palo Alto, which was pretty nice! We scrimmaged against Dream Team Two that summer on national TV, which was a great experience. We had a very talented team: Duncan, Pierce, Brevin Knight, etc. We had to beat Puerto Rico twice in their home country, and for their fans it was like the national championship. Duncan did not play so well in the first game against Puerto Rico but dominated in the second game. In 1998 you were named one of the four most influential coaches in America East history (along with Jarvis, Rick Pitino, Jim Calhoun): what did it mean to you to receive such outstanding individual recognition, and how does it feel to be mentioned in the same breath as those 3 other coaching greats? I was a little shocked to have something like that happen. I cut my teeth at the D-1 level in the North Atlantic and America East for almost two decades, so nobody has the level of respect for this league that I do. Most people today have no clue that guys like Pitino and Calhoun coached in our league. From 1999-2005 you served as head coach at ECU. Why did you decide to leave Drexel, and did you have any regrets? In retrospect, yes, but you make decisions and try not to look back. I had passed on a couple of opportunities earlier in my career so perhaps I just got cold feet. I knew they would eventually join the CUSA but I did not think it would happen after my first year. Several of our opponents ended up joining the Big East, so it was a tough league. It is hard to win on the road at that level. 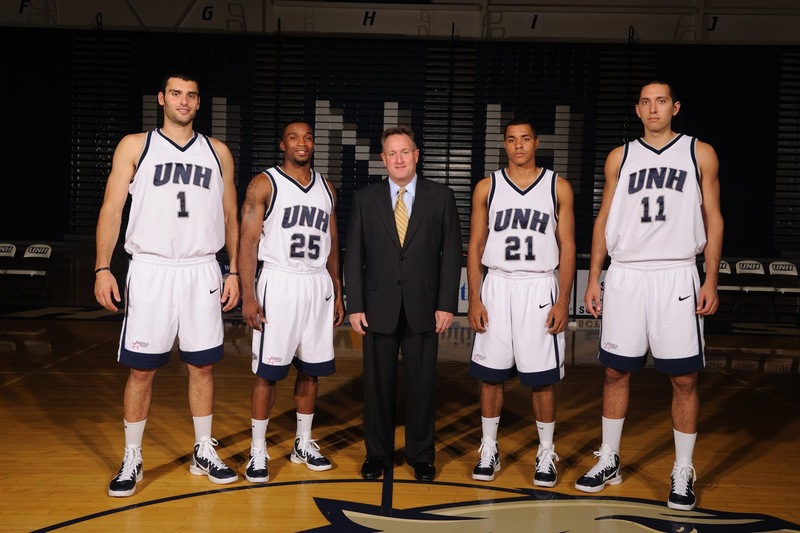 In 2005 you became head coach at New Hampshire, where your son Ryan played for you. Why did you make the switch from ECU, and what was it like to coach your own son? Arkansas coach Stan Heath called me during the Final 4 to offer a job as 1 of his assistants, but the New Hampshire job opened up that summer and I still wanted to be a head coach. It has been a real challenge but a positive challenge. I wanted Ryan to go to a D-3 school but he wanted to come here and be a walk-on. Your brother Tom was head coach at the College of Charleston and an assistant at Pitt before becoming head coach at Marshall. Who is the best coach in the family, and will we be seeing Marshall on your non-conference schedule anytime soon? If you go by records then Tommy has the upper hand right now. Not many guys get a second chance in this business but he was fortunate to get the opportunity at Marshall. I am naïve enough to check out a team’s roster to see if they are bringing back a good squad, and Marshall might be good next year! You are known for teaching the “Four Out, One In Motion Offense”: how does it work, and why has it been so successful for you? The “success” is up for debate! My reputation has been more of a defensive coach: I take pride in getting kids to overachieve. When you have a guy like Malik Rose you just give him the ball inside, but the game has changed so much with everyone spread out on the floor. You have to keep adjusting as a coach. When people look back on your career, how do you want to be remembered the most? I hope that people say I came into the gym every day with a tremendous work ethic and did not cut any corners. My players did not always enjoy how demanding and tough we were, but I hope in the long run that those things paid off. I have done it the right way with dignity and pride.